Today, Puerto Madero sinthetizes what is most modern in its vanguard towers, fashionable restaurants and five star hotels. But only 15 years ago the area was desolated and frequented only by the people related to port activity. In 1887, President Julio A. Roca was persuaded by the tradesman Eduardo Madero to have a port built in order to facilitate growing international commerce. Up to that moment almost a hundred projects had been offered, including one by engineer Luis Huergo proposing to build a harbour at the moth of the Riachuelo. But it was Madero who realised his plan of a port that became one of the most active in the American Continent. 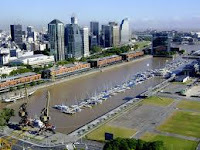 Nevertheless, its moment of glory was short lived since in the beginnings of the 20th century, due to the increased bulk of the vessels, Puerto Madero became obsolete and Puerto Nuevo, used to this very day, had to be build. 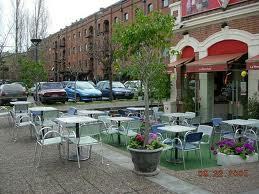 Slowly the area became more and more neglected and for almolst a century closely resembled a ghost town. In 1989, during President Carlos Menem´s term in office, works for space recovery and the development of its 170 hectares were started. Soon cinemas, universities and restaurants were installed, the old silos were recycled to become luxury offices, many high-end hotels were opened and companies, including Repsol YPF and Mercedes Benz, made it their corporate headquarters. 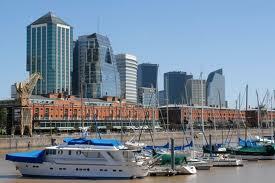 Puerto Madero is today the most expensive district in the city averaging over U$S 4000 the square metre. It´s growth is ongoing, with many projects which will add distinctive features to the city. Among these, English architect Norman Foster´s stands out. This same architect was the one to design "El Aleph", a 200 million dollar urban project, the floating mall on the Dock 2 waters belonging to the Hotel Faena and the eleven towers planned for the old grounds of the La Boca sport center. 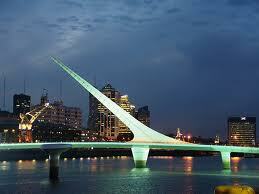 Location: To the East of San Telmo and the city centre, skirting the Río de la Plata. Main arteries: Alicia Moreau de Justo Ave., O. Cossettini, Juana Manso, de los Italianos Ave.
How to get there: Buses 130 and 152, and tram going from Independencia Ave. to Córdoba Ave.
Best time to visit: Daytime, to make the most of its architecture. Neighbourhood corner: Pierina Dealessi and Macacha Güemes.